Thank you, it's not so bad to restart, I hadn't done that much !! That's weird why would they give you a piece of fabric that's too small? I'm glad you caught it before getting very far it looks great! 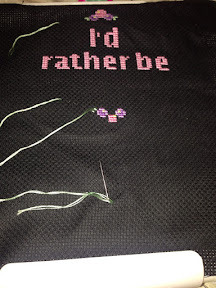 I think it may have been just mine as I bought a replacement and it is slightly bigger which just gives enough space to stitch the bottom writing !! But I'm going to stitch it on a much larger piece of aida from my own stash just to make sure !!! How frustrating for there not to be enough fabric for ths design. These free kits get worse and worse! It's the second kit I've run out of thread on but never fabric before !!!! Think I'm unlucky with them because I'm not particularly wasteful with thread ! !